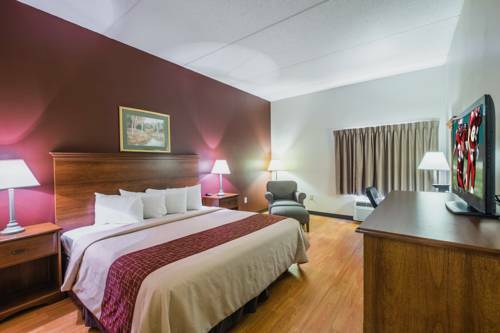 Red Roof Inn Hendersonville, NC is a pet friendly, family friendly hotel in the Blue Ridge Mountains of North Carolina. This hotel is close to Pisgah National Forest, DuPont State Forest, Holmes Education State Forest, Chimney Rock Park, Lake Lure, Biltmore Estate, Asheville Civic Center, Western North Carolina Agricultural Center, the Mineral and Lapidary Museum, Thomas Wolfe Auditorium, Brevard Music Center, Garden Jubilee Festival and the Apple Festival. Within 10 minutes of historic Hendersonville, Margaret Pardee Memorial Hospital, Carl Sandburg Home, Park Ridge Hospital, and Blue Ridge Community College, Red Roof Hendersonville is also a 10-15 minute drive to the Western North Carolina Agricultural Center, the village of Flat Rock, and Chimney Rock Park. The fabulous Biltmore Estate is just 21 miles from this hotel. White Squirrel town holds an annual festival attended by white squirrel mascot, Pisgah Polly. Also a Miss White Squirrel beauty pageant. Souvenirs year-round at the White Squirrel Gift Shoppe.